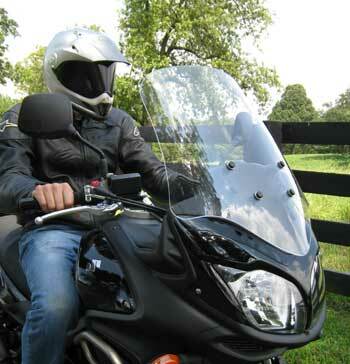 The Parabellum windshield for the 2012 Suzuki 650 V-Strom uses an advanced design incorporating a aerodynamic compound curvature for a quiet ride and better gas mileage. It is made from 3/16 inch thick, military aircraft grade cast acrylic, used for it's optical clarity. It is offered in 3 heights and in clear or tint. 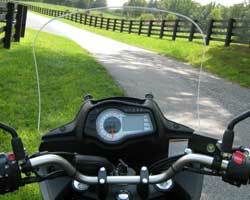 The Parabellum windshield is 5 inches wider than stock at 19 inches wide. NOTE: everything got better when we used mirror offsets (included) to allow the windshield to be just enough wider so it works really well. 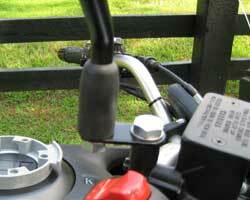 This windshield is a direct replacement and it mounts to the stock mounting points with new fasteners provided.